To explore different ways to split test your Facebook ads so you can refine your ad campaigns, I interview Andrea Vahl. In this episode, I interview Andrea Vahl, a Facebook marketing expert. She’s co-author of Facebook Marketing All-in-One for Dummies and co-founder of the Social Media Manager School. In addition, Andrea is a regular contributor to Social Media Examiner. 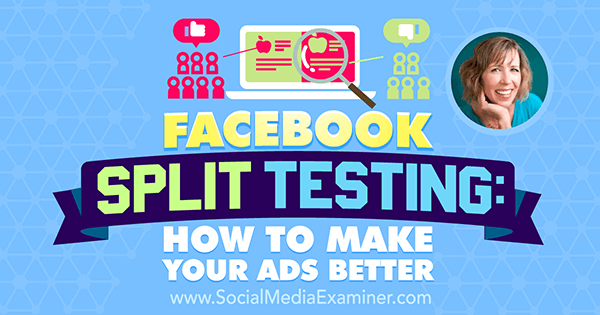 Andrea explores Facebook split testing and how best to optimize your Facebook ads. You’ll discover which elements to split test first. 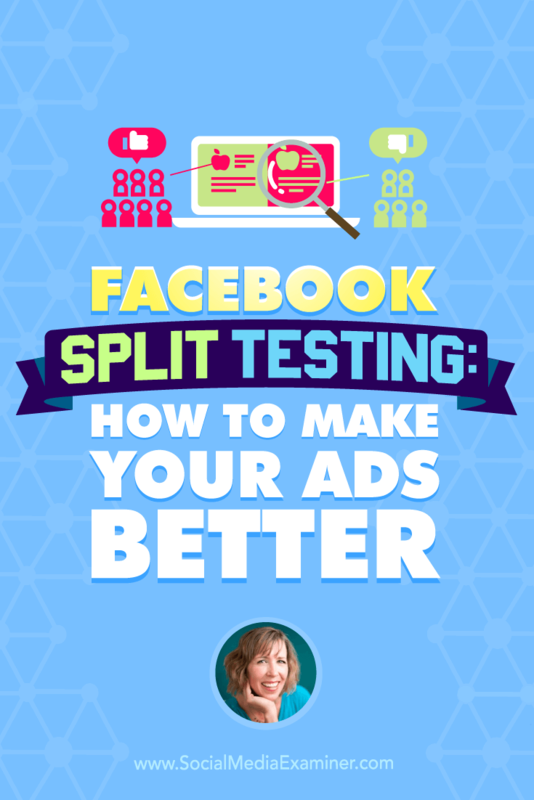 Listen as Andrea Vahl shares what marketers need to know about Facebook split testing and how to make your ads better. In 2006, Andrea started using social media to promote her side business (in-home wine tasting). She says that as she was learning how to use Facebook and Twitter, she didn’t see a lot of articles that were entertaining and explained things step by step. According to Andrea, Grandma Mary gets a little cranky about social media. The character is the voice of people who are frustrated with having to learn social media. Grandma Mary explains social media in an endearing, engaging, and understandable way. Andrea turned her Grandma Mary character into a social media edutainer. Andrea started her blog about nine years ago, and when the parent company of the wine business folded, she made the blog her side gig. It grew substantially (she had a lot of Twitter followers and Facebook fans), which led to the book deal for her to co-author of the Facebook Marketing All-in-One for Dummies series with Phyllis Khare and Amy Porterfield. Today, Andrea still blogs about Facebook, does Facebook consulting, runs ad campaigns for clients, and more. It’s her full-time business and she gets to speak and train on Facebook all over the world. Listen to the show to discover which two loves Andrea combined when she created Grandma Mary. Andrea explains that the concept of split testing Facebook ads involves keeping things constant, while changing one thing about the ad at a time. That way, you’ll easily be able to tell which variable contributed to the better-performing Facebook ad results. Then you can stop the ads that aren’t performing, continue running the ones that are, and hopefully get your click price and cost lower and lower. For example, if you split test an ad to 1,000 people, 500 would see one version and 500 would see another. Then you compare the results. The hope is that you learn what works and what doesn’t so larger audiences can be reached. Start by split testing interests. First of all, Andrea says, you can split test all kinds of keywords, which go into the Interests area. 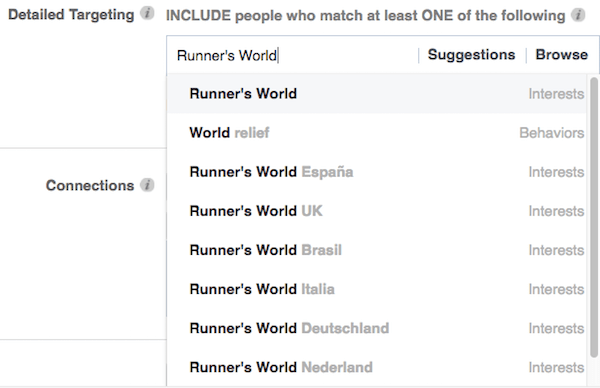 For instance, if someone lists jogging as an interest in a profile, and you use that keyword in the Interest area of your Facebook ad, your ad will get shown to that person. Your ad could also be shown to people who have liked pages that are related to jogging, such as types of jogging clothing or shoes. You can also test all kinds of demographics. For example, say you want to reach people who are 35 to 55, live in a certain city, like certain things, and maybe own a home. There are all kinds of demographics targeting you can put in your ads to reach your perfect prospect. For Interests, Andrea suggests using general keywords like “jogging” and “running,” versus specific pages like Runner’s World or Nike shoes. She says you can also target the fans of a specific page by typing the page name into the Interest area within Demographics. If there’s a match, it will populate and you can target the fans of that page with your ad. Type in the name of a page to see if you can target their fans. There are other elements you can test, including different images, ad text, and call-to-action buttons, as well as different bidding methods or styles of ads (such as a website conversion ad versus a lead generation ad). Listen to the show to hear our thoughts on testing certain audiences. Andrea suggests testing the demographic first since you want to find the most responsive audience for further tests. To do this, Andrea keeps the ad looking exactly the same (the same image, text, and call to action) and simply splits the audience (alters the demographic, interests, etc.). Doing this helps determine which split responds best to the ad and gives her the cheapest clicks. Andrea says you can also target demographics within your existing fan base, but cautions that it gets a little challenging. For instance, you might want to target website visitors who also like certain things or have a specific level of income and see who responds better to an ad. You can do that, but you have to make sure you’re not targeting an audience that’s too small. Listen to the show to discover what size audience Andrea likes to test. There are a lot of settings in ads, Andrea explains. First, you choose the objective of the campaign, whether it’s optimizing your website clicks, getting more conversions, or something else. Then you go to the ad set level, where you choose things like the audience (targeting) and where to put the ad (the sidebar, in the news feed, or on Instagram). You’ll also find budgeting and schedule options at the ad set level. The budgeting type (lifetime versus daily) can impact ad performance. Lifetime budgeting allows Facebook to optimize your ad spend. A daily setting means you want to spend $10 every single day no matter what. Conversely, with lifetime budgeting, you’re saying you want to spend $150 over the next 15 days, which would essentially work out to $10 a day. However, you’re letting Facebook optimize that $150 over the course of those 15 days. Andrea says usually lifetime budgeting is a little bit better, although it can be challenging because you don’t always have a set end time. 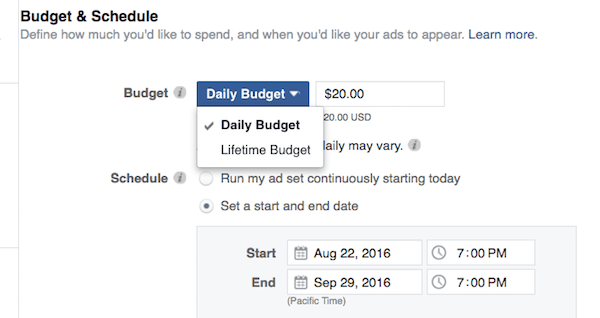 With lifetime budgeting, you’re letting Facebook choose what’s best for your ad. Listen to the show to hear what Andrea thought the first time she saw the option to let Facebook optimize for her and how she feels about it now. Objectives are also something you’ll want to test, Andrea says. It’s really about the ad vehicle that’s being offered up to your audience. Lead generation ads all happen within Facebook, while a website conversion ad happens on your website. There are benefits to each. Testing different objectives will help you find the right fit. It’s good to test different vehicles and different types of ads with different objectives, she continues. Most often Andrea finds if people are attempting to get a true conversion on their website, where they want someone to opt into a lead magnet or make a purchase, the conversion ad is the best ad type. Listen to the show to discover why it’s so important to test things for yourself. Andrea says you should split test at different levels to see what works for you. The campaign level is the top level, which is your objective. The ad set level contains the budget, the timing, the schedule, and the targeting. The ad level is the creative elements (the image or video and the text). One thing to keep in mind is that the ad set level controls your budget, the timing of the ad, and when it’s being run. If you have two ads underneath the ad set and you want to test both, the budget may not get delivered equally between them. Make sure you’re in control of how much spend each version gets, so you’re running them through the cycle you want. Andrea says the ad set level is the best way to split test. You can easily copy ads completely, switch a few things, and let them run. While demographics are really important to test, the next biggest factor to test is the images. Another option is to test image ads versus video ads while keeping the objective the same. Andrea has also seen people use slideshows to make their images a little more active in the news feed, so that’s something to try as well. Andrea stresses that it’s important you aren’t tweaking the current ad. Make sure you create a copy of the ad and turn it into a brand-new ad. If you don’t do that, you won’t have a record of the changes you’ve made. Creating copies will keep your statistics pure, so you’re clear about what happens with each ad. Listen to the show to learn some of the challenges that come with splitting budgets. When determining the duration of a test, a lot depends on the audience and budget size. Know your audience before you start testing. If you have an audience of a million people, you can run more variations at smaller budgets. That way you aren’t burning out a small group with 15 different ads and competing against yourself. Andrea usually tests between 5 and 10 ads. Since there are so many factors involved, you really don’t want to compare your tests to what you hear from other people. You’re always testing against yourself, so you want to attempt to come up with the best possible ad for your demographic. Then review your reporting. To declare a winning ad, Andrea says you need to compare things like the cost per website click or cost per conversion. You also want to look at the click-through rate. If you show your ad to a bunch of people and no one is clicking through, that’s saying your ad may be a dud or that your audience is not quite as receptive as you thought. How much weight should be placed on cost per conversion versus cost per click? Andrea says she typically doesn’t care as much about the cost per click, as long as she’s getting the cost per conversion. Again, you have to do your own testing to figure out your range. What Andrea does with her clients is have them set an upper boundary (the maximum they’re willing to spend). 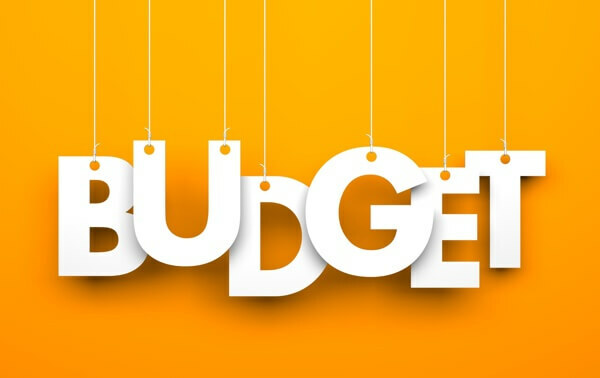 It’s important to know your marketing budget and to make sure you’re hitting that target. Know your marketing budget before you start testing. We talk about the different ways Facebook and other reporting systems calculate conversions. There seem to be discrepancies, no matter what vehicle. This creates a challenge. You’ll often get a different number from Google, your shopping cart, or merchant system, and then a different number from Facebook. Andrea feels like Facebook over-reports a little bit. You have to realize that Facebook sees that someone has visited the site, so if they go back to the site twice, it might count as two conversions. You’re able to set a conversion window where you say you only want Facebook to count conversions that happened within a day after seeing the ad. Another way to get around that is to make sure you’re using backup reporting. Use things like UTM links or whatever tracking you have in your shopping cart to make sure you cross-check each number. As far as timing is concerned, you definitely want to allow at least a week or two for testing. It depends also on how well you’ve already tested. If you’re starting from scratch (you don’t know your keywords or what audience is responding well), you’ll definitely want a couple of weeks to do that. Run your ads for a few weeks if you’re just beginning. In addition, you’ll be testing things like the demographics and targeting, images, maybe the type of ad, and so forth, so there are a lot of potential tests to run. Sometimes you want to run those non-concurrently so they don’t affect each other. If you’ve already zeroed in on the perfect keywords and demographics, you can probably shorten that test cycle to a week. Now you can test things like five different images, different text in the ad, or some different type of video ad. Andrea says to remember to keep your variables controlled so you know exactly what’s working for you. People tend to vary too many different things at once, and they’re not sure exactly what contributed to that positive change. It’s really exciting when you can watch your costs go down and you know it’s because you put in a little bit of time to test. Listen to the show to hear from Grandma Mary. 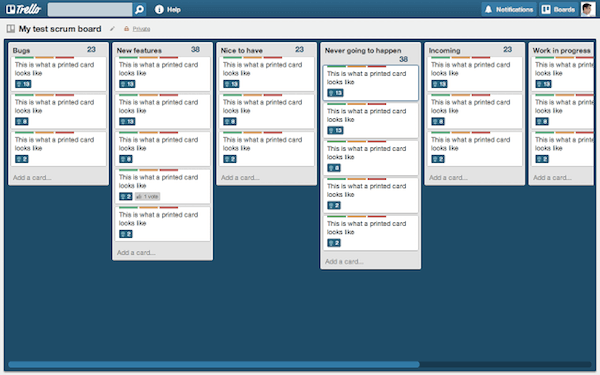 If you’re not familiar with Trello, it’s a project management tool that’s web-based (and free). The Chrome browser works on both PC and Mac. Slim Lists for Trello takes your existing Trello boards and reduces the width. Trello has a bunch of different cards that are ranked and sorted into lists. This will give you all (or at least most) of the information, reduced up to about 50%. Doing this allows you to fit more on your screen. If you’re not already on Trello, check it out. It’s an amazing tool. If you work collaboratively with many people, Trello is a lifesaver. It also has an app that does real-time communication. You have all of the information and all the right people with access to it in a nice, neat, organized location. Listen to the show to learn more and let us know how Slim Lists for Trello works for you. Learn more about Andrea on her website. Read Facebook Marketing All-in-One for Dummies. Check out Social Media Manager School. Follow @AndreaVahl and @GrandmaMaryShow on Twitter. Like Andrea and Grandma Mary’s Facebook pages. Learn more about Phyllis Khare and Amy Porterfield. Create and split test Facebook ads. Take a look at Runner’s World or Nike shoes. Check out Slim Lists for Trello and Trello. What do you think? What are your thoughts on Facebook split testing? Please leave your comments below. 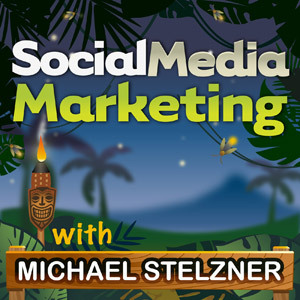 Andrea Vahl talks with Michael Stelzner about how to make your Facebook ads better with split testing.